Concerned that I might be shooting off the mark, I went out yesterday and did a bit of re-zeroing. The first shot I put into the target (the uppermost one) was perfectly on the intersection of the horizontal and vertical lines - God, I thought, that's astounding! The rest of the group, however, was more dispersed - that's groups for you. After going up and looking at the overall position of the pellets, I decided that the average of their positions was falling somewhat low. I went back 30 yards to the shooting spot, uncapped the top scope adjustment cap and tried to figure out how many clicks meant a movement of about half an inch up at thirty yards. After failing to remember anything that might help me to work it out, I made a guess instead: five clicks 'Up', then. 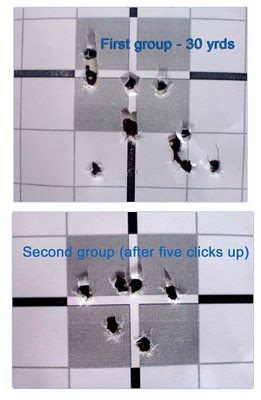 I shot off another group of six (the lower picture above). There were no astonishing and misleading bulls-eyes this time, but, instead, the group had indeed moved up so that the group of shots more accurately surrounded the bulls-eye than it did before. I spent a little time after this trying to see if there was a lot of difference between the zero point of the RWS Superdomes that I've been using over the last month or so and the rest of the tin of H&N Field Target Trophy's that I'd used before this. I also threw a group in with Air Arms Diabolo Fields to see what that could tell me. And what did I learn? I learned that trying to do this sort of thing in a hurry and draw conclusions from hastily thrown off groups is a bad idea. It'd take, I decided - at least with my shooting, anyway - a procession of groups with each of the different pellets before anything could be properly learned - and I didn't have the time to do that yesterday. So I learned that if I do want to learn stuff then I have to allocate proper amounts of time for learning - and not hope to get rich (with knowledge) quick.